Home Articles Legal Articles How to lodge a complaint against your bank? 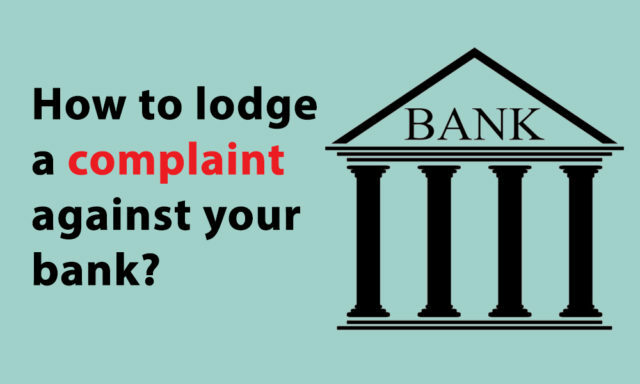 How to lodge a complaint against your bank? The economic development of the bank depends on the development of banking the sector. Sometimes the banks also violate certain rules and cause inconvenience to the consumer. So there have been some ways to help the consumer when a bank did malpractices against them. There are many malpractices done by the bank against the consumers. It includes the delay of payment or the gathering of cheques, Nonacceptance of small denomination notes, inward remittances are delayed, if the drafts or pay orders are delayed, not providing services promised by the bank, complaints on remittances of the NOT Resident Indians, when open deposit accounts are refused without any reason, levy a customer without a notice, delay in acceptances related to taxes, delay in closing the accounts, etc. ‘Grievance Cell’ is a unit provided by every bank that helps customers to file complaints against the bank. It includes the delay of payment or the gathering of cheques, Nonacceptance of small denomination notes, inward remittances are delayed, if the drafts or pay orders are delayed, not providing services promised by the bank, complaints on remittances of the NOT Resident Indians, when open deposit accounts are refused without any reason, levy a customer without a notice, delay in acceptances related to taxes, delay in closing the accounts, etc. There has an identical toll free number for each bank which will be provided to the customers of that particular bank. Also, customers can also lodge the complaints in online mode since the banks have started a Real-Time Monitoring System. After filling the complaint t, a customer’s needs to wait for about 30 days to get the reply or to have a solution to the problem. National Consumer Helpline is a helpline in which several banks have entered into convergence and complaints related to banks are mailed to the respective banks through an electronic mailing system for immediate resolution. Customers can initially complain to their respective banks, then to the Banking Ombudsman who is appointed by the Reserve Bank of India and finally, there will be a legal route for every case. The National Toll-free Number is 1800-11-4000. How can we complain to a Banking Ombudsman? The National Toll-free Number is 1800-11-4000. Also, we send the complaint through emails. The filing of complaints can be done without any cost. Compensation or an amount will be given by the banks for the loss suffered by the customers. The Compensation will be up to 10 lakhs. All the complaints are tracked with help of Registered Id or the Complaint Reference No. provided at the time of registering. In the year 2014, Reserve Bank of India has released the “Charter of Customer Rights” which contains the principles for the protection of bank customers. It contains five basic rights. The RBI has informed the Indian Bank’s Association to make a “Model Customer Rights Policy” that covers all the principles in the charter.